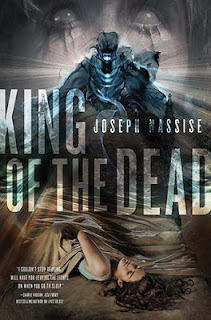 King of the Dead by Joseph Nassise returns readers to the urban fantasy world of Jeremiah Hunt, and as the second book in this series, readers are already familiar with the protagonist, Hunt, who gave up his eyesight in order to have a different kind of sight. He uses this vision to see the supernatural world in order to try and find his missing daughter. Now he’s on the run, since the FBI suspect him of being mass murdering dark sorcerer. Along with him are a witch, Denise, and Dmitri, who is a berserker as well as a shapeshifter. The three of them are making their way to New Orleans to find out if Denise’s vision of the city falling prey to sinister forces is true. Even though they’re on the run, the trio plan to use their combine talents to determine who or what is killing people. As far as locations go, New Orleans, with its rich history of magic, voodoo, and haunted places is perfect for this type of story. Jeremiah, who lost everything important to him in the first book is the kind of hero that doesn’t do anything spectacular. That isn’t a criticism; instead of taking on all the bad guys, Jeremiah’s talent for seeing what others can’t doesn’t give him superhuman strength, or any other gifts, and so he has to be smart about what he does, and also rely on the strengths of Denis and Dmitri. Having a hero that isn’t all-powerful makes for a much more interesting read, and Jeremiah is definitely learning as he goes along. The story shifts from Jeremiah’s point of view to other characters, such as Denise, and that of an FBI agent hunting the group. This may not bother some readers, but others might find it awkward, and so it bears noting. Another potential issue is the pacing of the book, which first fills readers in on what happened in the last volume, and then picks up the plot of this new story. However, once Denise, Jeremiah, and Dmitri wind up in New Orleans, both the action and story pick up speed. The combination of action, an atypical hero, and supporting characters with their own abilities makes King of the Dead a strong continuation of a series that adds to the urban fantasy genre.